The kitchen is perhaps the most integral part of any home. After all, it’s the primary source of food, and everyone loves to eat. There’s always a favorite dish to revisit, a new recipe to try, a snack to savor in between meals, or a big smorgasbord to create for a special holiday. 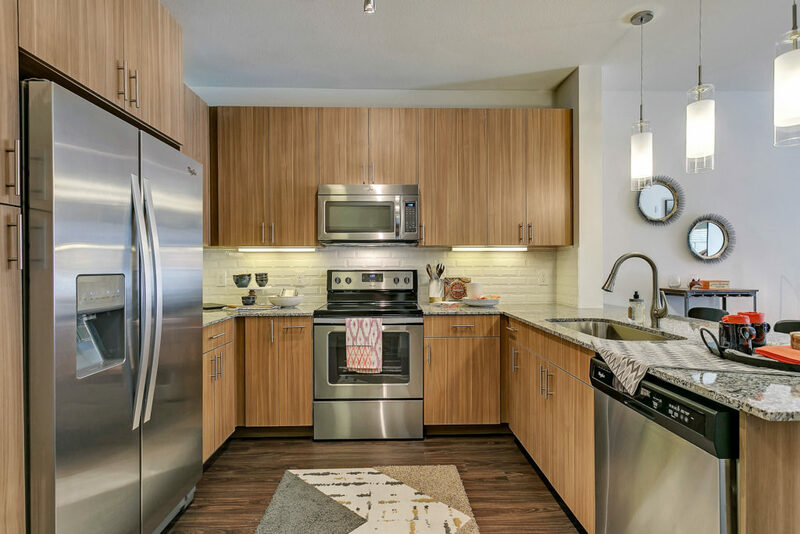 Our luxury apartments in Dallas at Alexan West Dallas are designed from room to room with superb https://alexanwestdallas.com/features/ and comfort, including our kitchens. First of all, our living and dining areas are decked with either smooth stained concrete or wood-vinyl plank flooring. Both materials are strong enough to handle most accidents in the kitchen – including spilled wine, glass shattering, and the occasional happy set of pet paws pouncing on floor scraps – while matching seamlessly with any décor scheme. Store all your spices, groceries, and cookware with ease in our custom hardwood cabinetry, with 42” uppers, spice racks, and large pot drawers for accessible organization. Roast, sauté, fry, chill, or boil your ingredients to perfection using the contemporary stainless-steel appliance package, featuring a double-door refrigerator with an in-door water and ice dispenser for instant refreshment. Set up your serving trays or prep your meals on the sturdy granite countertops. Look up a new recipe online through your handheld device and then plug it in to charge using the USB ports installed throughout your home, including the kitchens. Finally, add some stimulation through music and dance while you cook using the Bluetooth speaker system placed in many of our apartments. Enjoy the best flavors of life here at Alexan West Dallas. Explore our appetizing luxury apartments in Dallas and our amenities today.